Zadig & Voltaire sweater (c/o); 7 For All Mankind 'Josefina' jeans; DV Dolce Vita tassel loafers; Ray-Ban aviators; Kooba bag (c/o); NARS 'heat wave' lipstick. So I'm doing this thing where I'm just never going to smile in photos again. I know I keep talking about this whole lipstick thing, but, it's actually changing my life. Whenever I put it on and someone asks me to smile for a picture, I just curve my lips and try to look as too-cool as possible. Why is that? I'm usually grinning like a buffoon at all times, especially when posing for oncoming traffic in the East Village. I don't think I'm the only with this affliction, though. I feel like all the fancy, grown up ladies I know who wear lipstick do a lot of "smizing." Right? I hold this Kooba bag near-and-dear, and use it religiously. Kooba was the first brand to reach out to me through my blog, after I put this bag in a round up of camel-colored items for fall 2010 (yep, that long ago). They sent me the bag, which became my first "c/o" item, which was totally nerve-wracking. I've worked with them several times following, and I love their people as much as I love their bags. Meghan and I have started doing this thing where we meet on the corner of 12th Street and Avenue A before work in the morning to take photos for each other. Coincidentally (or ironically?) these are the days I struggle the most to put together an acceptably bloggable outfit. That fall chill I've been talking about inspired me to bust out this super-cozy cashmere sweater from Zadig et Voltaire and my equally comfortable boyfriend jeans and trusty tassel flats. Whether that qualifies as bloggable is certainly questionable, but here it is. Oh hey - my teeth! Loving this look on you! You always look so effortlessly chic. A cashmere sweater is definitely going to be added to my closed for fall. Obsessed with that sweater. Love your AM photo partnership. I want in! 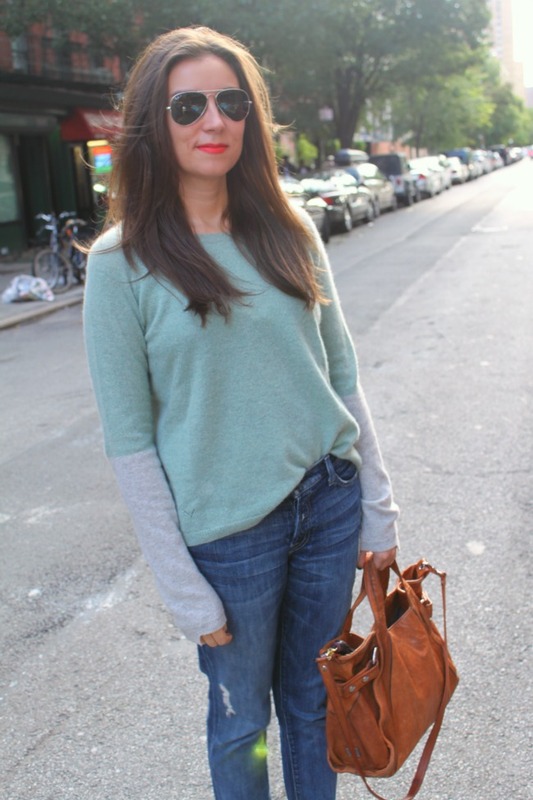 said it before, i'll say it again- love everything about this and the lipstick color is great with the mint sweater. I was going to write that I love this shirt on you...but then I feel that it would sound weird without me telling you to shut up also. Ha! Love those flats! They are the perfect blend of casual & comfy, but still chic. I love your suede shoes and the little tassel! Adorable!! I also LOVE Kooba and always rock their gear. Softest leather and super chic. Love the color of that sweater! A search feature is also available to easily find your photos. The tag navigation help you to discover pictures without knowing the content of the gallery. Indeed, the most used tags are highlighted below the search. EZ Rental Car is the Best Value in Car Rental, offering late model rental cars at convenient airport locations from friendly and efficient car hire agents at discount rental car rates. Book your car online today. Great post.It really contains valuable information.very well written post. thanks for sharing. like this very much.This blog will be helpful for me.